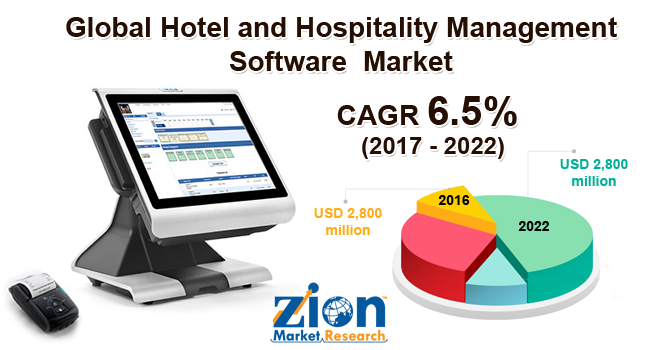 The new report by Zion Market Research on the “Global Hotel and Hospitality Management Software Market — Global Industry Analysis, Size, Share, Growth, Trends, and Forecast 2016 – 2022" has a vast information about the market and its potential. The global hotel and hospitality management software market was valued at around USD 2,800 million in the year 2016 and it is expected to reach approximately USD 4,300 million by 2022. The global hotel and hospitality management software market is expected to exhibit a CAGR of more than 6.5% between 2017 and 2022. The rapid growth in the tourism and the hospitality industry is the major factor driving the growth of the hotel and hospitality management software market. Tourism and hospitality industry is considered as the third largest sub-segment in the services sector which includes trade, repair services, hotels, and restaurants. The research analysts in their primary research observed that as several prominent players in the industry have innovative offerings at competitive rates, to fulfill end-users requirements. The global hotel and hospitality management software market is segmented on the basis of the hotel type, type, deployment, and the geographical regions. Business hotels contribute a major share in the growth of the hotel and hospitality management software market. The increased facilities that are provided by the business hotels such as unified communication capabilities help the business people and other guests to conduct meetings and conferences. Thus it is estimated that this segment will register a comparatively high growth in the future years. The guest service management system is anticipated to grow at the highest CAGR during the forecast period. Increasing demand for automated real-time optimized guest services and the rise of demographic growth are expected to propel the market growth in the near future. The on-premises segment was the leading segment and it accounted for the major share of total revenue generated in 2016. This growth is mainly due to increasing adoption of the on-premises application software on account of rising need to improve business productivity. The major market players in the hotel and hospitality management software market are Johnson Controls, Jonas Software, NEC Corporation, Oracle Corporation, protel hotel-software GmbH., Schneider Electric, Siemens AG among others.